Packers @ Eagles Postgame « Roll Out the Quevedo! I’d like to throw two “thank-you’s” out to the Eagles this week. To Michael Vick- thanks for thinking you’re a passing quarterback on 3rd and goal. To Andy Reid- thanks for thinking Vick can run between the tackles on 4th and 1. What was that? We have seven on the line, five of which are inside their ends and they don’t get Vick in space? He gashed us for more than a half and you run that play??? Again, thank you. I’d also like to throw out an apology. In my season preview, I questioned our offensive line and compared Mark Tauscher to an 80-year old man. I’d like to apologize to all 80-year old men. You all have much quicker feet than either of our tackles. Paint dries faster than Tauscher and Clifton. Any road win in the NFL is gold. Add to it an NFC team you haven’t beaten in their hometown since 1962, and there should be little complaining. One last thing…I also mentioned in the season preview how Brandon Jackson would eventually be asked to be a 1st and 2nd down back. I hate being right. 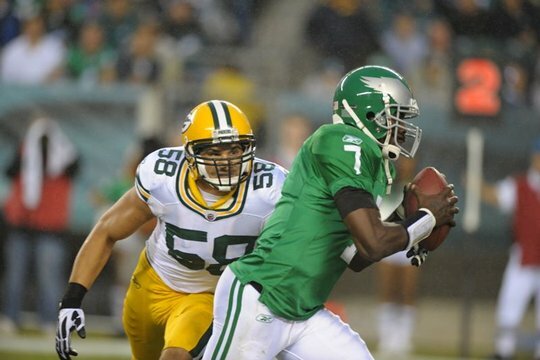 1) Our defense- It was all-world until Vick was forced into action. Even though Vick moved the chains, the Packers still had 5 sacks, three of which were on Vick. McCoy only had seven carries and they limited DeSean Jackson to four touches on offense for 30 yards. Woodson was Woodson and Matthews was better than last year. Holy crap! 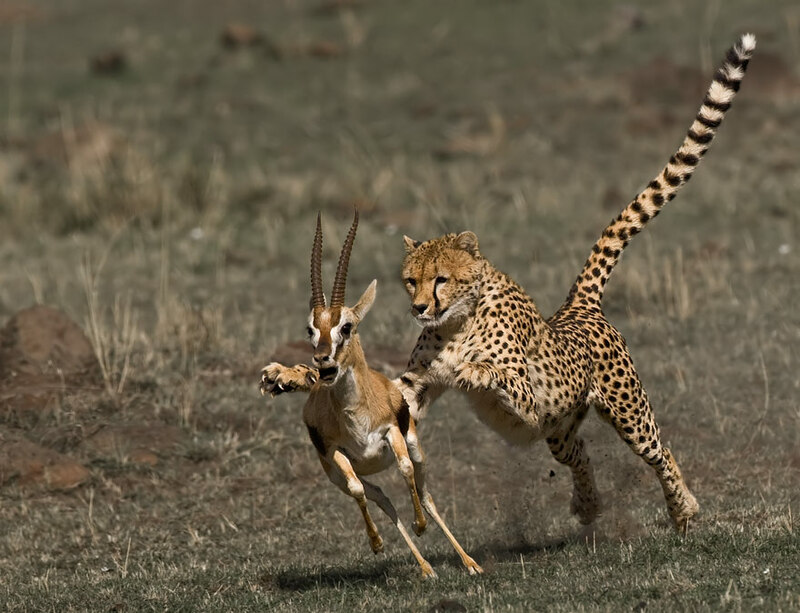 His first sack, Matthews looked like a cheetah pouncing on an impala. 2) Special teams- Kudos to the Packers’ special teams Sunday. That was one of the top ST performances in recent memory. Across the board: returns, especially KO returns, were solid. Coverage was solid. On punts, we had four punts and Jackson only managed two returns for 11 yards. Very nice. And besides the kick-off out of bounds, Mason Crosby was huge. We’ll re-visit him later. Now do it all again this week and prove it wasn’t a fluke. 3) Offensive dominance- Perhaps the greatest part of Sunday was that the offense was, in their own eyes, terrible and yet we put 27 points on the board. Rodgers was off most of the day. Grant goes down. Finley found out that teams are going to be forced to double-team him or Rodgers is going to target him EVERY TIME. I see vast improvement Sunday. 4) Andy Reid’s gameplan- Wow, the Eagles sucked in the first half. They were setting all kinds of records…in futility. They couldn’t get Jackson the ball and Kolb looked like a scared, confused rookie. Vick saved them and created a huge problem in the process. Glad I’m not an Eagles fan. I’m going with Crosby’s 56 yard field goal to end the 1st half. Not only did it put the Pack up two scores going into the half and put all the momentum in Green Bay’s favor, but how many of you thought there was any chance that was going through as they were lining up? Come on, 5% of you? Too high? Huge play. Clay Matthews- I guess Allen Iverson is right. We’re talking about practice. 7 tackles, 2 sacks, 2 TFL, and 1 FF. He looked quicker than last year. His dropped interception could cost him the NFL Defensive Player of the Week, but wow, how can I pick anyone else.